Thanks for stopping by. 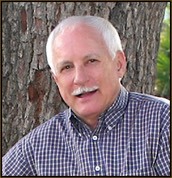 I am a South Texas native and a retired journalist, TV anchor and independent video producer. Having lived and worked around the world I have had a great time. Below are some links to fun times including a link to my gory death scene in the Italian cult film, "The Beyond" and rare film production photos that will take you behind the scenes. There is also a link to a 30 minute documentary I wrote and filmed in Amsterdam telling the story of the Nazi invasion and Dutch Jewish Holocaust there in WWII. In 1980, the Lousiana Film Commission, knowing that I speak fluent Italian, asked me to meet Italian film producers who were bringing Italy's very on Hitchcock, famed director Lucio Fulci, to shoot a horror film in New Orleans. I became assistant to the producer and even had a short scene in the film, the first to die from the zombie curse! I did a stunt fall off a high scaffold where my character was a house painter. CLICK HERE for some original behind the scenes production photos from the shoot including shots of the stunt fall, and location shots in the French Quarter and elsewhere. CLICK HERE To watch a 2 minute YouTube clip of the fall to my death from the milky fatal gaze from the female zombie's eyes! 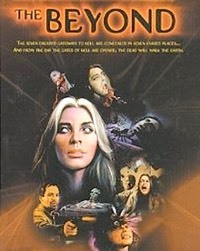 The clip is in Italian, but the DVD is available in English on the web, and "The Beyond" has become a cult classic with its own Wikipedia page. 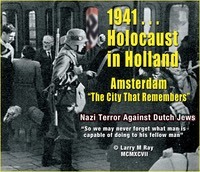 In 2007 I shot a 30 minute TV documentary in Amsterdam on the Nazi invasion of 1940 and the roundup of thousands of Dutch Jewish citizens who were sent to their deaths in Auschwitz. I located a contemporary of Anne Frank, Jaap Van Veltzen who was 12 years old when he escaped from a Nazi kindergarten, the only member of his family to survive. He tells our story. If you would like a free DVD to place permanently in schools, churches, libraries, synagogues., etc. click the contact link at the bottom of this page and I will send you one! I also publish a blog, 'the iHandbill,' which is a "retired journalist's take on the news." It is is a moderate, liberal blog that harks back to my activist days at the U of Texas and involvement in the early civil rights call for an end to racial segregation. Humor, lots of supporting research and the cynical eye of an old journalist is reflected in my writing. I also design and create the intro graphic above each article. Click the graphic above to visit. So. 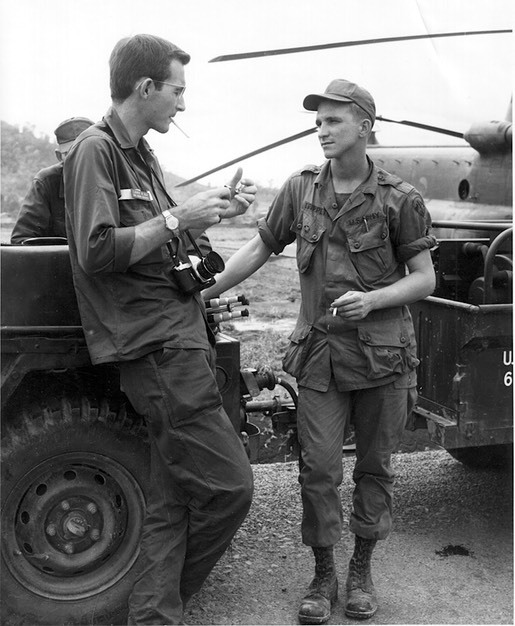 Vietnam, 1966, that's me at left, lighting up a cigarette! As a retired journalist and independent video producer I have been fortunate to have had a life full of variety, world travel, and fun. This eclectic personal web site has been expanded with content which varies widely from my work as a journalist including my year in Vietnam as a correspondent . . .
. . . to my work as a fine art gourd artist. 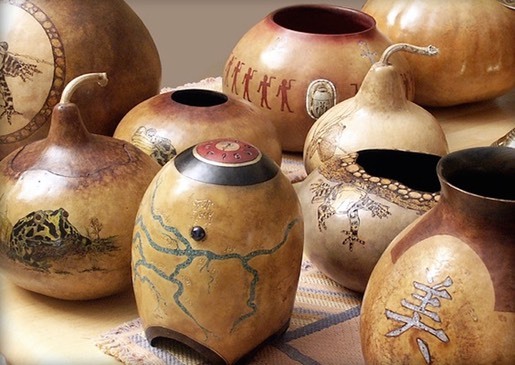 I will show you examples of elaborate gourd decoration which is done using pyrography, leather dyes, inlaid stone and other techniques . . . I grew up in a small fishing and shrimp processing town, Aransas Pass, Texas. 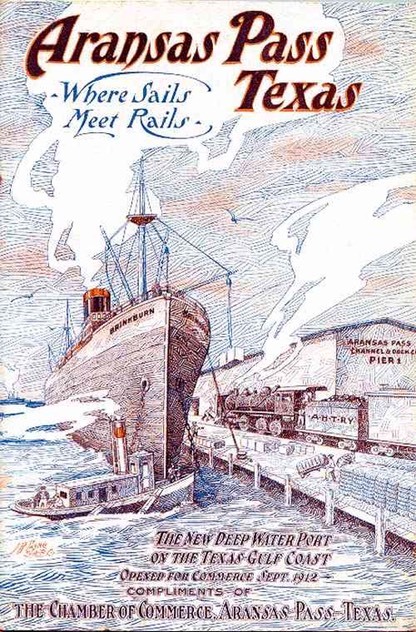 It has a colorful early history and I have included a rare promotional booklet from 1912 when the town was being nationally promoted. People flocked down to the Texas Gulf Coast for the last of the illegal land lotteries in the USA. The old photos and descriptions of the little town are a trip back in time. 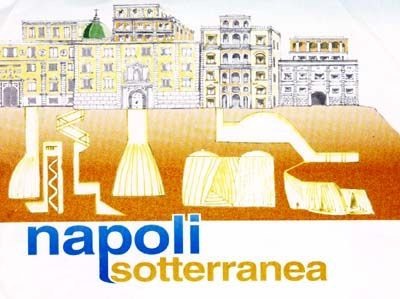 We will visit the secret world hidden beneath Naples, Italy where 2,500 year old Greek and Roman aqueducts, huge tunnels, passegeways and gigantic quarried caverns create a "parallel city." Take photo tour by scrolling down and down into this marvel for a virtual visit. See how WWII air raid shelters were created using the warren of tunnels and cavities below the streets of Naples. The "Cronies" are a unique group of friends from all over the United States. For many years we engaged annually in various adventure outings. "The Cronies," a name by one of the wives that stuck, include two retired Air Force Colonels, one is a three-time NASA shuttle commander and USAF test pilot, the other was a B-52 commanding officer and forward air controller ... both served in the thick of the Vietnam war, one of our outstanding Crony chefs is a forensic CPA and outdoorsman, a legendary handlebar mustache is sported by our internationally famous commercial jet engine specialist, our other chef was raised on New Orleans cooking and is retired from NASA where he was involved in space education and in the teacher in space program, our infamous trip planner is a an aerospace Ph.D. and a former NASA educator who now divides his time between teaching and helping run the huge family ranch in New Mexico, and the chronicler of all the Crony activities is a worn out old TV anchorman who has hung up his flying wings too. 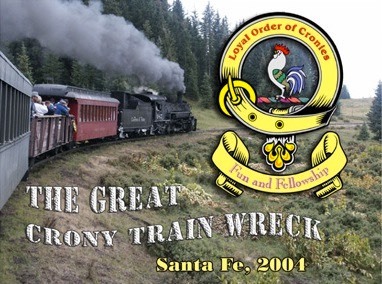 Most of us are now retired, but I have posted one of our "Cronygrams" from a day's outing on a fine old narrow gauge steam train which included a jolting derailment!